Obviously, Angus Trim is the better sword and more realistic, but the UC swords are more beautiful. The Angus Trim is less than half the weight of the UC sword too. I don't know much about swords, only what I like to look at, and I guess a lot of you actually use the swords for martial arts and the like. Would any of you get an authentic movie reproduction sword (the authentic Conan Atlantean sword weighs 8 pounds!!! ), or would you just stick to "real" swords? I don't know how to phrase this question, only to ask I guess - what is authentic to you? Is getting an identical movie reproduction authentic to you, or the only thing authentic is a "real" sword that can be used in battle? Guess it comes down to what you want. If you want a sword in the truest since of the word, something you can use that will work as a sword is meant to work and will not fail you; the Trim is far and away the best. If you want something for cost effective and attractive home decoration; some of the movie versions can be great options. However, as with most things, not all movie versions are created equal. Their main limitations are that they often do not feel or handle like true swords (weight being obvious) and more than a few are not intended to withstand use. Intended use is the key. Knowing what you want and know why you want it will help make you much happier with whatever option you choose. Posted: Mon 01 Nov, 2004 5:02 pm Post subject: I guess what I'm asking.. I guess what I'm asking is.. for you purists out there, would you ever consider buying a beautiful movie reproduction or would it be "beneath you" to do so? None of the "real" swords I have ever seen come close to the beauty of the movie reproductions. Then I would submit to you that you simply haven't seen enough "real" swords. Please examine our Reviews section. 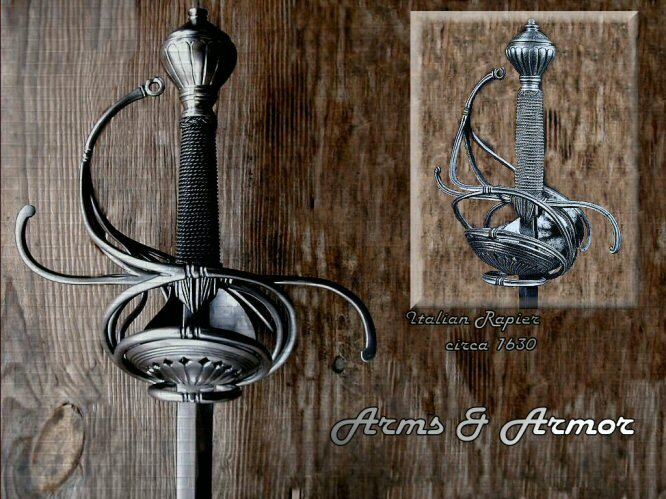 You'll find many examples of historically correct and functional swords that are as attractive as any movie reproduction. If you desire a decorative piece than swords made by United Cutlery, Marto, and others are fine. If someone is looking for a functional and/or accurate sword than these simply won't do. It just depends on what you're after. If I were in the market for a wall-hanger or a decorator sword, the Lord of the Rings swords are far and away the best looking movie-production swords I have seen. To me they look like real swords (even though they aren't due to the steel, rat-tailtangs,etc). On the other hand, if you're one of the lucky ones with the budget to afford them, www.filmswords.com ,which is an offshoot of Albion Armorers, also has some awesome looking stuff. Barring those however, if you want a sword that's in the price-range of the LOTR swords, there's also Del Tin Armi Antiche and Museum Replicas Ltd. As far as functional swords are concerned, they are on the lower end of the spectrum, but they look nice, and again are relatively inexpensive. I buy swords with the intention of martial arts use, however, if I saw a movie-production sword I really liked, whether it was functional or not, I would have no qualms buying it. As long as you understand the difference, it all boils down to what you like. purely decorative swords before, as have I think many Forum members. I say buy what winds your watch, if it makes you happy it's right. This is a tough question to answer. Everyone views things differently. My preference is for historically based weapons. Film swords and decorative replicas are not "beneath me," they're just not my preference. They aren't more beautiful than "real" swords, because to me, part of a sword's beauty is its combination of beauty, lethality and responsibility. A non-functional sword is the same as a painting of a sword for me: beautiful in its own way, perhaps, but still not a sword. For me part of a sword's beauty lies in the design aspects that make it functional. What problems did the designers face and how did they overcome them? Those are the things that really interest me. Consequently decorative swords don't interest me because they don't share these aspects. I generally agree with what most people have said here already. Though, as Patrick mentioned, I would like to point out that there are MANY non-movie based swords that not only rival, but surpass anything I've ever seen in any movie. But part of that has to do with how discerning you are. The UC LOTR sword, in my opinion, are gorgeous designs on a base level. But they lack in many of the subtle detailings that higher end swords have, such as the fine shaping of the guards, and so on. These are elements that I used to ignore until I got much more involved with sword collecting. The second example has lots of decoration on it, and there was a time long ago where I may have preferred it. But after a certain point, you grow to realize just how intricate and complicated the guard of the first one is. The bars, which appear plain to a casual glance, are well formed, with subtle swelling at just the right places, and took much more care to create than the cheaper second sword. Would I have appreciated this when I was first starting out? Probably not. But it's something that I really do appreciate now. Another thing, though, is the feel of the sword in the hand, which is a tremendous factor to me. I don't know what the second sword feels like, but odds are they didn't put much care into making it handle like an antique sword should handle. When I buy a sword, it has to be a sword that could be dropped into a time hole and found by our ancestors, who wouldn't think anything was out of the ordinary about it. (Well, maybe I'd want them to say, "Hey, that's pretty nice! ", but you get my point. ) As a martial practitioner, I need that aspect to practice correctly. As a collector, I demand that aspect to know that I'm collecting a sword that is also a work of art, rather than an art piece that looks like a sword. Just my thoughts on the matter. Posted: Mon 01 Nov, 2004 7:58 pm Post subject: Re: I guess what I'm asking..
Answer 1: At this point in the collecting journey, probably not. Mainly because I've finally started exploring WMA and study has affected my opinion and preference significantly. My answer might be different if I used more of my swords as decorations, but right now they probably better qualify as tools. Answer 2: Sounds like you need to get more time, experience, and exposure under your belt. As you see more swords you will see swords that put most anything seen on film to shame. Next year take a trip to Atlanta Bladeshow. Your opinion WILL change. thanks for the replies.. I know what you're saying, and I already guessed most of the responses. I realize that the "beauty" you see is from a purely functional perspective, and I respect that - and heck to some degree I agree with it wholeheartedly because I too appreciate the superb engineering involved. For me, since I was a kid of 10 years old, reading Fighting Fantasy books, I would have my wooden sword my Dad made me and I would drift off into imagination. 20 years later, a sword to me is nostalgia. I agree with many of you regarding the "beauty" of the LOTR swords - they "look" real, and yet they have that slightly fantastic look about them. Actual "real" swords don't have that "fantastic" look about them for obvious reasons - because they're made to function, not to look like they were made by an Elf. I have already bought the Glamdring sword (it's on its way), but after looking at Angus Trim swords, and reading about them - I can't help being fascinated by the martial art that went into its construction. However - what the heck would I do with a "real" sword? None of my friends own one! I'd be hacking away by myself. In the end - I will probably buy an Angus Trim sword also, just for the sake of appreciation, but I also think that a decorative sword like the LOTR swords have a place for ARTISTIC beauty, rather than FUNCTIONAL beauty. I was just hoping that in the opinion of real sword collectors, that I would not be doing something frivolous by buying a decorative sword. Lastly - can you experts tell me what's wrong with the steel used in the LOTR swords? I understand they're not made to whack things with, but what else is wrong with them? What would be the reason for using them in the first place? Posted: Mon 01 Nov, 2004 9:33 pm Post subject: One last question: what's a rats tail tang? One last question: what's a rat's tail tang? In the picture in the review above, I thought that was a rat's tail tang, but the review says it is a fully developed tang. What is a rat's tail tang, and are there any pictures comparing a rat's tail versus a real one that you purists would respect? For what it's worth, I think the LOTR swords are gorgeous, and leaps and bounds better looking than most fantasy swords. In fact, if you like those swords, you may not realize it yet, but you probably already have a leaning towards historical blades and don't even realize it yet. I saw their exhibit in Boston, and got to see the movie props up close, and the arms and armor are in most cases pretty distinctive in what type of historical culture's essence they were trying to capture. The majority of decorative swords have blades that are made from 420J2 stainless steel. This steel is very soft (as steels go). It's carbon content is low enough that it can't be properly heat treated. It's softness is a plus in this arena because it's easily machined, which is why it's used. Since the swords are decorative the heat treatment issue is irrelavent. The hilts components are typically made from zinc castings. This material is far too brittle to be used on a functional sword. If subjected to moderate use they will quickly crack and fall apart. In sword terminology a rat-tail tang usually consists of a stub of a tang that's welded to a piece of threaded rod. It's enough to hold the components together but not much else. You also seem to have the assumption that a functional sword cannot be as attractive visually as a fantasy replica. This is far from the case. Here are companies that offer high end functional swords that are very nice aesthetically. Here's a couple more that offer a lot of fantasy work that is also functional. Finally a few custom smiths who are second to none in their respective areas. I was just hoping that in the opinion of real sword collectors, that I would not be doing something frivolous by buying a decorative sword. In the end you're the only one who can decide that. If all you desire is a decorative sword than it isn't frivolous. On the other hand, if a buyer is desiring a functional sword and they've purchased a decorative piece unkowingly then it's a waste of money. It's all about needs, desires, and expectations. By educating yourself you'll make sure that all of these factors are met. However - what the heck would I do with a "real" sword? None of my friends own one! I'd be hacking away by myself. Hopefully you won't be "hacking" away at anyone with a real sword, so what your friends own is irrelavent. Owning a functional sword is all about gaining a full appreciation of the art and craft that goes into it's manufacture. This simply can't be gained from owning a decorative sword. In the end it's all about deciding the level at which you want to approach this hobby. I really like Vince's new site (or maybe I just didn't know about this one?). Also, love the hilt on Rick Barrett's "Elven Short Sword." Alex - The choice is up to you [now where have I heard this before?]. But I think you make a mistake in thinking functional and cool looking fantasy designs are mutually exclusive. I mean just look at Rick Barrett's site or Jody Samson's site. Granted that these are fairly expensive compared to the UC swords, if you want functional and fantasy in a sword, it can be done. I fully appreciated state-of-the-art functional hand craftmanship. I am a collector of fine watches, and my favourite brand is IWC (www.iwc.ch), my most expensive piece being $7000 (I have a "main" collection of 6 watches ranging from $1000 to $7000, and whole bunch of watches below $1000). The construction and finishing quality in hand-made IWC watches really blows away the cheap nasty watches below $500. However, the days of spending big on these things are gone, and I can't afford to pick up another expensive hobby. A sword is a wonderful thing, but unlike a watch, I can't carry it around with me and admire it everywhere I go. It has a very limited area of enjoyment. I will definitely want a "real" sword now, maybe around $500-$600 from Angus Trim or some other maker around that price point. Of course it would be great to get a fantasy sword AND a real sword, but I'm not going to be spending >$1000 on a sword I just swing around a few times and look at when I get home. Rick Barret's swords are stunning - and it is nice to know that they are made like real swords, but again $3000 is a bit much for me. For now, my UC Glamdring will have to tide me over until I can afford a "real sword". Do you think I can swing my UC Glamdring around without worry of it breaking? I don't intend to hit any surface with it. Thanks for the advice! I really enjoyed reading the Sword Forum website - thanks for the link. Actual "real" swords don't have that "fantastic" look about them for obvious reasons - because they're made to function, not to look like they were made by an Elf. As far as I'm concerned, a 'fantasy' sword is any non-historical sword. Like the LotR swords, they don't have to equate to griffon-claw quillons or six-foot long, partially serrated blades. There have been examples of functional fantasy swords mentioned earlier in this thread, but I'd just like to reduce the contrast between these pieces and historical weapons. A fine example of a less extreme 'fantasy' offering is Al Massey's stunning Claidheam Mor. This leafbladed claymore never existed historically, and might easily have been dreamed up for a (vast) elf to wield in a recent Tolkien-inspired movie. But it's a real sword - a functional weapon, the design of which was derived from a combination of European originals, prizing functionality first. Fantasy swords are not just limited to the outrageous pieces that appear so tasteless to those who value historical accuracy. I love the idea of fantasy swords. So much so I've even kept hold of my purchased-in-ignorance-at-the-age-of-seventeen Art Gladius Starfighter (complete with its twin-snake pommel, hidden dagger in the grip, and partially serrated might-as-well-be-six-foot-long blade...). I have sympathy for the wall-hanger crowd who prize comic-book designs above historical replicas, because much as it shames me to admit it, it's not just sentiment that keeps the Starfighter in my closet. But I wouldn't even consider buying such a sword again; and the reason is this. Taste aside, interest in historical precedent aside, fantasy 'swords' do not capture my soul unless they're real. The more outrageous a sword, the less real it is going to feel in my hands - the less like a true sword; even given a decent tang, high-carbon steel blade, and sharp edge. I'm so glad you're considering buying an ATrim. You mentioned a desire to swing around your Glamdring replica at home. To answer your question, I wouldn't - rat tail tangs don't enjoy even that mild level of stress, and if it snaps you might make a weapon of that blade yet, albeit an accidental one. Wall hangers should be hung - anything more is tempting fate. But that desire to experience the blade physically is the reason those of us who have held real swords never go back (no matter how eccentric our tastes may be!). I don't know why you bought your UC Glamdring, but if you have any desire to swing it, then you must have some desire to experience the sword as a weapon. Whether you take that experience into the realm of test-cutting, or stick with dry handling; you're obviously not going to cut down your foes with your UC or your AT. Dry handling, you'll still be directing steel through the air with your arms. But the difference is the potential. Wielding an AT is a totally different sensory experience, and you don't have to take it to war to feel closer to history or to fantasy than you could ever possibly get while swinging a wall hanger. A lot of us started out with movie swords we felt were exciting; but we learned through sensory experience that the excitement doesn't come from the closest aesthetic reproduction - it comes from holding a functional sword in your hand. I think you'll feel closer to a sword-wielding character on screen when you hold a real sword - even if it looks worlds away from the one on screen - than you will holding a sword-shaped object that could be the film-sword's twin. I know I do. thanks James for your insights. Incidently, I am situated in Edmonton Alberta. Where do you get your swords from? By the way - so is my UC Glamdring safe to swing around or not? I am not going to be striking anything with it. so is my UC Glamdring safe to swing around or not? Not it's not. I've seen a few of these swords disassembled and the construction isn't sturdy enough to take even moderate swinging around. They're made for display nothing more. I own an UC Glamdring. Useful only as decoration, it is nevertheless a very nice piece to look at.